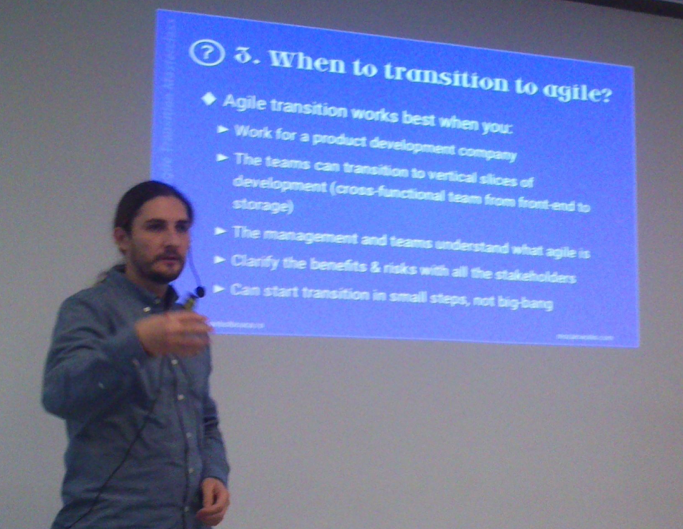 This is a talk I delivered in Bucharest for the Agile Software Meetup Group. More and more companies want to transition to agile, because the benefits of faster delivery are essential in today’s software market. Me and Mozaic Works’ approach to transforming an organization to agile has a lot to do with our core beliefs of small steps and fast feedback. For us an agile transformation is a tailored process for each organization, and the context is always essential. Starting with the WHY is very important. I want to understand the internal values of the company and then decide together with the management, sponsors and the teams why they want to make this transformation. Without having the active involvement in any transformation, the whole process becomes very difficult or even impossible to put in place. I don’t want to start from “what process to use” (Scrum, Kanban, DSDM, SAfE, etc), but rather discover the process while working with the people from that organization and understanding their needs. Together we create the process by applying things I know work well and by experimenting some things that might or might not work. As with any type of design, I prefer taking decisions as late as possible, because the more I learn the better the decision is.